The 16E Mellophonium was advertised by Conn as a mellophone with the bell straightened so that it could project directly to the audience. The 16E has a #3 (0.500") bore and was in production between 1957 and at least 1978. It was probably discontinued after 1979. Perhaps most famously, it was used by Stan Kenton in his "Mellophonium Band" to fill his need for "an extra voice between the trumpets and the trombones". There are various stories going around about Stan Kenton's personal involvement with the development of the 16E, ranging from "he invented the thing" to "he had nothing to do with it". Clearly Stan Kenton didn't invent the 16E because it appeared in Conn literature (in 1957) well before Stan became involved with the 16E Mellophonium (1960). As is often the case, such stories tend to change as memories fade, or are embellished from one telling to the next. I have been in contact with Noel Wedder, who was personally involved with the Stan Kenton organisation at the time, and with George Ferencz, Department of Music of the University of Wisconsin. The following is the most likely version of events. Noel Wedder was told by Stan Kenton that while he and Johnny Richards were in residence at a Kenton Clinic held at Indiana University during the summer of 1960 they came across a Conn 16E F-Eb Mellophonium (a model that had been in Conn's catalogs since 1957, as mentioned before) and did some "construction" work on it with a hacksaw, trimming down the valve slides in order to create a mellophonium keyed only in F.
Background: Conn advertised the 16E as being in "Eb and F". Standard was F, and it could be lowered to Eb. This was done either by inserting a section between the mouthpiece and the mouthpiece receiver, or in a different account there were two different tuning slides, one for F and a longer one for Eb. The question is to what length the valve slides were built: F, Eb or some in-between compromise. If Stan Kenton and Johnny Richards trimmed down the valve slides with a hacksaw, that would suggest that standard length was either Eb or an in-between compromise. Other accounts say that the length of the valve slides was for F to begin with, thus not requiring any trimming for correct tuning in F. In that case possibly the standard length for F, or Conn's compromises for F, were not to Stan Kenton and Johnny Richard's liking and the trimming was to correct that. Stan Kenton and Johnny Richards brought to the Kenton Offices the "prototype" they had constructed in a dormitory bathroom following the mentioned Stan Kenton Clinic. 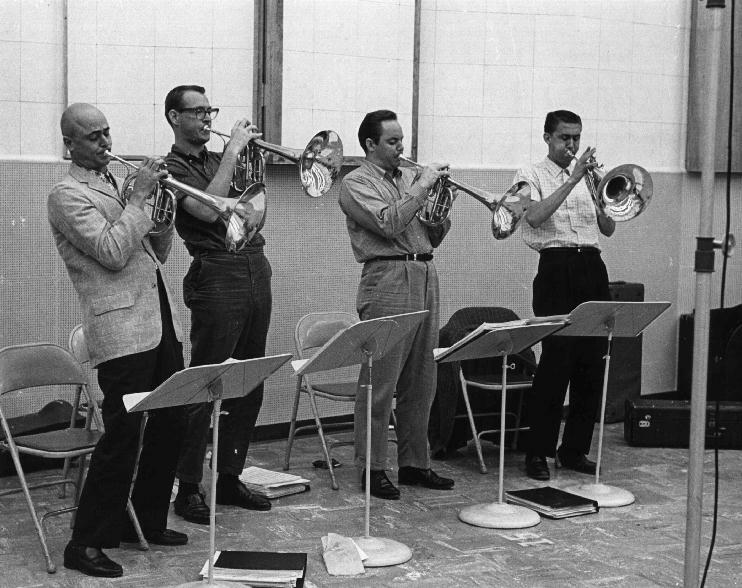 They called in Gene Roland, one of the Orchestra's arrangers (also a musical savant who was capable of soloing on trumpet, trombone, mellophonium, soprano saxophone and piano) and asked him to begin putting the prototype through its paces. Roland, off the top of his head began playing "Misty", which he later arranged for the full Orchestra. Everyone, including Lee Gillette, Stan's executive producer at Capitol Records, was so capitivated with the instrument's sound Noel Wedder was charged with shipping the prototype off to Conn that afternoon. Noel Wedder says he saw the prototype (at the time he was in charge of promotion for the Orchestra) so he knows it existed. Aside, many people have wondered what has become of the Kenton mellophoniums. I gather that when the Mellophonium Band was disbanded in 1963 the 16E's went back to Conn. Probably they were destroyed along with many other things when Conn's new owners, Crowell Collier MacMillan, moved the factory from Elkhart to Abilene in 1971. New "voiced" designed to meet the trend in stage and and concert bands and orchestras. Easy to play in the colorful range but with the sound projected by this "solo" bell straight model. New effects and balance are made possible and any brass player can play this new horn. Features include: Crysteel valves, balanced for easy holding, even scale, full voice in alto range, Lustre-Conn finish. Bell size 11 1/8". Also available: Satin silver plated with polished silver inside bell, Satin silver plated with polished gold bell. If the roster of mellophonium players on the Stan Kenton website listed above is correct, this picture must have been taken July 5-7, 1961.